Adult clothes do not always fit me well. I have a petite frame...I'm short, almost 5 feet but not quite, and weigh around 105 lbs. All my jeans have to be tailored, even my leggings (Athleta does free legging alterations, ladies)! I have an especially difficult time finding dresses. Often I can get away with shopping in the girls' section where I am size 14. Of course, kids clothes are a lot more stylish than they used to be so I can get lots of cute clothes for much cheaper than women's clothes at stores like Zara, HM, Nordstroms, Bloomingdales, and Forever 21. So, I thought I had been banished to shop in the kids' section for the rest of my life until..... eShakti.com! eShakti.com reached out to me to customize a garment of my choosing from their website. They have A LOT of stuff! Dresses, skirts, tops, pants, everything..., but the kicker is they can customize any item to fit your unique body. All you have to do is input the measurements, click, click, click and you will get your custom dress or other item within a month! I was impressed with how easy it was to order, and how fast I got my item. How to Customize Your Order. First, decide what you want! This is the hardest part because they have a large selection of everything. I looked at about 30 pages of items until I finally decided to strategically think about what I needed in my wardrobe. I remembered that my husband's birthday was approaching and that I might need something special to wear. I wanted to customize something that was versatile enough that I could get a lot of use out of it for future weddings or dinner parties. 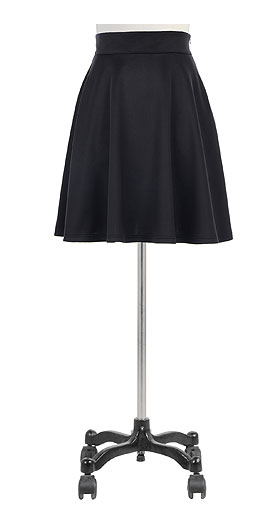 I came across a black A-line scuba skirt. It's perfect to wear on any occasion with almost anything -- a crop top, bodysuits, even a t-shirt! I have tried on scuba skirts and dresses at Bloomingdales, but even the smallest sizes were too big and too long or fit awkwardly. Scuba material isn't forgiving and must fit snug in the necessary places in order to avoid looking frumpy. Second, decide how much you want to customize -- A) standard or B) custom. A) Standard Size fitting --> If your body is of a "general" proportion and matches the standard sizing (see below) you can choose between XS to 6X. 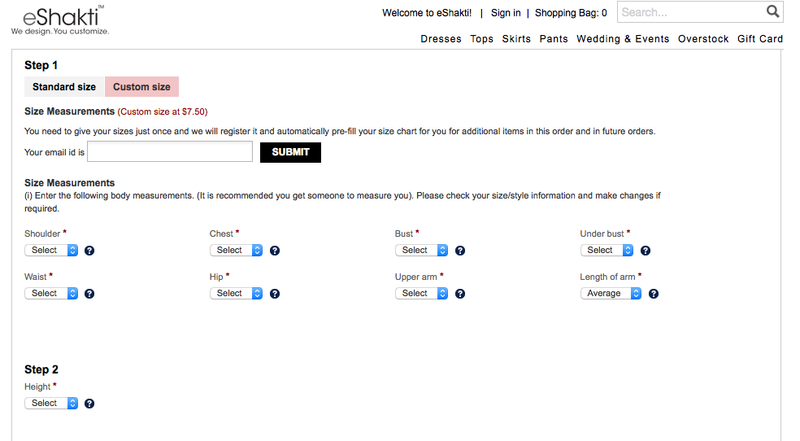 After, choosing your size, click in your height from the drop down menu. Then, decide whether you want to have custom styling (e.g. sleeve type, dress length, neckline) for an added $7.50, which is not bad at all (if you frequent the tailor you know this is super reasonable). Then, the fourth and final step, you have the free option (if applicable) to choose pockets or not. 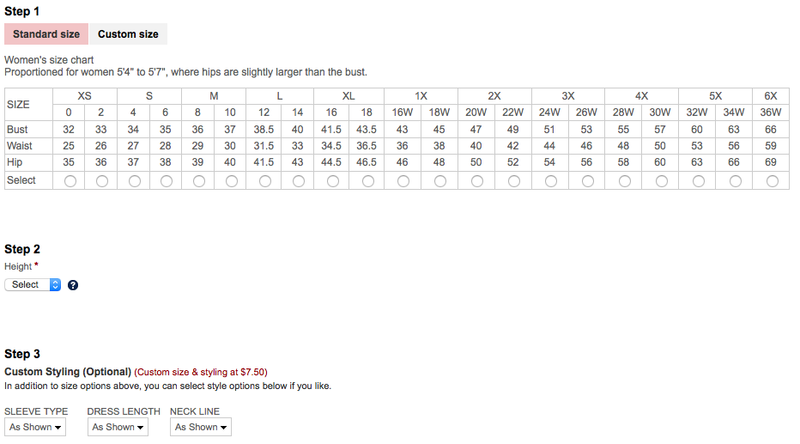 B) Custom Size fitting --> You to need get accurate measurements. To do this, you will need: 1) measuring tape, and 2) a friend! As you can see below, the required measurements are requested and all you have to do is measure and choose the corresponding inches from the drop down menu. Essentially, the Custom Size panel and the Standard Size panel's step 2, 3 and 4 are the same. So the only real difference between the standard size panel and the custom size panel are the size measurements. It's really quite easy and straight-forward. 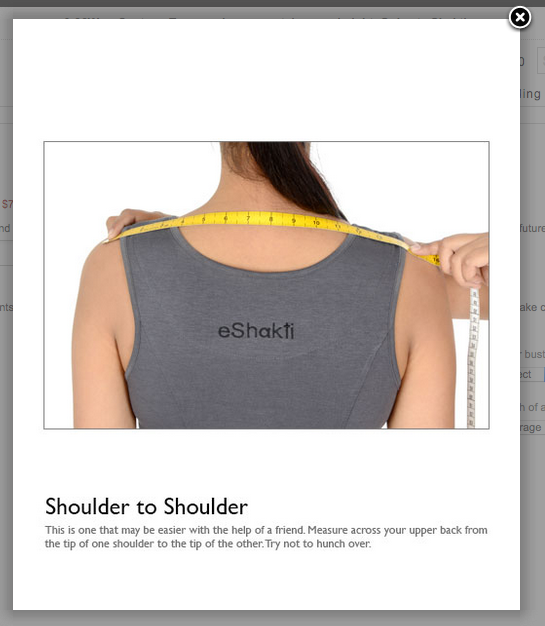 Taking measurements seems a little daunting, but you will only have to do it once because eShakti keeps your measurement on file for future orders! Also, next to each of the required fields is a question mark. Once clicked, the a window will pop up showing you how to measure the area. First, the ease of ordering and speed of delivery was on point. I received my skirt in one week! Second, I loved the variety of dresses. Third, most of the skirts and dresses have POCKETS! Yes, pockets are crucial as a mom, as a woman, right? This will be new go-to site when I am looking for a dress either for summer or a special event. I know I will get my item on time because you get a tracking number, and I know it will fit me like a glove. eShakti.com is great for women of all sizes and frames because they have so many styles of dresses from pin-up type dresses to maxi dresses. If you are attending a wedding during this summer season, there are so many guest appropriate dresses. Or if you are planning a wedding and want all your bridesmaid to be matching, but they are all different sizes or frames, eShakti is a really affordable option compared to JCrew or other stores that have semi-formal dresses. Use coupon code "mshealthyface" to get 10% OFF till May 2, 2015. Where's your favorite place to shop for dresses? Mother's Day Gift Ideas...on Fleek.